Less than two weeks before Election Day, a Donald Trump campaign ad was released in which Trump spoke Hindi – or at least attempted to – and repeated a campaign slogan from India’s Prime Minister Narendra Modi, a Hindu Nationalist. It’s one of the many attempts by the presidential candidate to win over the Asian-American community. Asian-Americans have more than enough reasons to dislike Donald Trump, but not all of them are averse to the Republican candidate. Many Chinese and Indian-Americans have become die-hard Trump fans because of their fear of Muslims and even outright prejudice against other ethnic groups. Scranton Pennsylvania, is not the most diverse town in United States – more than 85 percent of its population is identified as white. But that doesn’t mean the other ethnic groups are on the sidelines in this town. 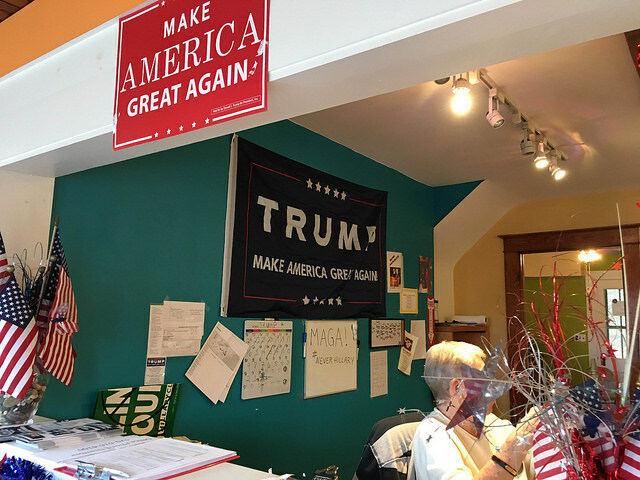 As immigration has become one of the central issues discussed in this election, many minority groups in Scranton are becoming more vocal and active in politics than they used to be. Satyajit Ghosh is an economics professor at the University of Scranton. He came to the United States for his doctoral degree in 1980 and settled in Scranton six years later. For Diwali, one of the most important Hindu festivals, he chose to spend his Saturday training volunteers in the local Hillary campaign office. However, not all minorities in Scranton actually think that way. Juen-ling Wang is a substitute teacher who was born in Indonesia. As an Indonesian-Chinese, she said she suffered from discrimination against Chinese in Indonesia, a Muslim-dominated country. After feeling that she was treated unfairly for her different religious and cultural background, Ms. Wang chose to leave Indonesia and came to United States in 2001. “I came to this country because I saw the opportunity to find equality here,” said Ms. Wang. She registered as a Republican right after getting her citizenship in 2009. “To me, security is number one.” When asked about why she is so affirmatively pro-Trump, Ms. Wang said his tightened policy on Muslim immigrants is what attracts her. “Muslims bring troubles wherever they go,” said Ms. Wang. The split political preferences within ethnic groups is not unique to Scranton. Asian Americans’ favorability towards the two candidates is increasingly polarized. While the latest survey from the National Asian American Survey (NAAS) shows only 14 percent of Chinese-Americans and 9 per cent of Indian Americans lean towards Donald Trump, some Chinese and Indian-Americans are some of Trump’s biggest fans. On October 29th, hundreds of Chinese-Americans rallied around Trump Tower in New York while a plane towing a banner that said “NY Chinese Americans for Trump” flew over the New York City. Just few days before that, Donald Trump gave a speech to thousands of Hindu Republicans in New Jersey and claimed that “we are going to be best friends” in reference to India and America. The reasons behind Chinese and Indian-Americans becoming such die-hard fans for Trump might not necessarily be the same. But there are some similarities. “For the past decade or so, the Democrats’ pursuit of excessive political correctness, over-pandering to illegal immigration and racism in the name of Affirmative Action have deeply shaken our belief in the American Dream.” said Chinese American For Trump (CAFT) on its website. ” To us, they are turning America into a less free, less innovative and less competitive country with their every legislative move. In short, America is in danger of decline in their hands.” This group says it now has over 6,000 registered members and has launched aerial ads in more than 20 cities across the country to show Chinese-Americans’ support for Donald Trump. Disappointment with the Democratic Party has led many Chinese Americans changing their side, like Heidi Little, a pathologist in Philadelphia and the Pennsylvania coordinator for CAFT. She is a registered Democrat but switched to support the Republican nominee early this year. Ms. Little said that “Democrats do not treat Chinese Americans that well.’’ She said she was concerned about the Asian disaggregation bill was proposed by Democrats in California. “I feel Chinese Americans are directly targeted and suppressed in this country,’’ she added. The disaggregation bill Ms. Little talked about is known as AB-1726. It would collect demographic data that can more precisely divide Asian people into ethnic or other subcategories. Some fear that the measure might be the backdoor for California to enact the affirmative action plans that could lower the college admission rate for Chinese-Americans in California. Many Chinese immigrants like Ms. Little see this bill as a threat against Chinese-Americans trying to achieve social and economic equality in this country. And they see Trump’s immigration policy a way to keep the doors open for highly-educated and skilled immigrants. A similar sense of superiority is shared by some Indian-Americans. “Some Indian people think they are superior than Mexican or African-Americans because of their skin color.” Professor Ghosh said a correlation between lighter skin color and higher social status was rooted in Indian culture. But what really attracts the most Indians towards Trump is his anti-Muslim rhetoric. The newly-released Trump campaign video included an image of the 2008 Mumbai terror attack and Trump vowing to defeat “radical Islamic terrorism.” In his speech in New Jersey, Trump pledged that he would support Indians and crackdown against Muslim extremism. Trump’s grandiose language appeals to many Indian-Americans, who have seen their mother country repeatedly struck by terrorism committed by Islamic extremists. Those Indian-Americans fear the same tragedies like the 2008 attacks in Mumbai that left 172 dead or the ambush killings of 20 Indian soldiers would happen here in their new country. Trump bluntly confronting with Muslim communities has made him a “hero” to some Indians. The concern for security is also shared by Ms. Little as well. “The United States is a country, not a charity organization,’’ she said. “Hillary will bring more refugees to this country when she knows there is no comprehensive way to vet all those people and terrorists have already infiltrated in refugees.” She added she was worried that a Clinton administration would not able to secure the border and keep the country safe. Could Chinese and Indian Votes Be Pivotal for Trump? Since 2000, the number of Asian-American and Pacific Islander (AAPI) eligible voters have grown by more than 1.2 million in each presidential election cycle, according to the National Asian American Survey (NAAS) for Fall 2016. APPI has become the fastest-growing population in the United States and more than 45 percent of AAPIs are comprised by Chinese and Indian-Americans. In some key swing states like Pennsylvania, Arizona, North Carolina and Virginia, the Asian-American population has grown by more than 80 percent since 2010, outpacing the growth in the Asian-American population overall. But Hillary has a vast edge over winning over the increasingly important Asian-American voters. According to NAAS, the Democratic Party advantage among Asian-Americans has grown since 2012. Compared to the national average, Asian American registered voters hold more favorable views of Clinton, and much more unfavorable views of Trump. NAAS projects Clinton will enjoy a 70-to-20 percent advantage over Trump in this election. As the Trump and Clinton campaigns head into the final stretch of their campaigns, there is no surprise to see the Trump campaign is making plea for support from one of America’s fastest-growing racial groups. But will this sudden gesture actually work?